I don’t remember how I found out about the new writer’s group forming in our small mountain community, but I looked forward to spending Sunday afternoons with fellow wordsmiths. It was through my writing group that I learned about author Ray Bradbury presenting a lecture at the Hilton Hotel, in Lake Arrowhead, California. Ray Bradbury. I only knew of him from reading Fahrenheit 451 in freshman English class. And our oldest son had read The Martian Chronicles several times as well as other Bradbury paperbacks. At the lecture, as soon as Mr. Bradbury began speaking, it was as though he were talking among old friends. I was mesmerized by his storytelling, the way he spoke of his youth and his love of comic books, carnivals, and his passion for writing. To this aspiring writer, his words sparked like magic. Afterwards, I purchased a copy of The Halloween Tree then had Mr. Bradbury sign my book. That day, I became a Bradbury fan. The Halloween Tree is one of my all time favorite reads. On Halloween night, eight trick-or-treaters gather at the haunted house by the edge of town, ready for adventure. But when Something whisks their friend Pip away, only one man can help the boys find him. Join the sinister Carapace Clavicle Moundshroud as he takes them on an unforgettable journey through space and time, deep into the mysteries of this spookiest of all nights. Can the boys save Pip before it’s too late? In 1993, a Hanna-Barbera animated version of The Halloween Tree narrated by Ray Bradbury and featuring the voice of Leonard Nemoy as Mounndshroud became available on VHS. To my knowledge, it’s never been released on DVD. If you find a copy, treasure it. Your best bet of finding the video is on eBay. 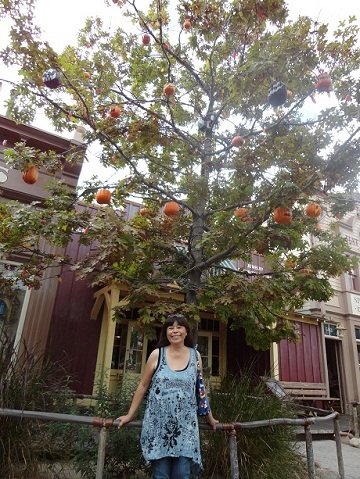 And during that time of year, when Halloweenistas make a beeline for the Haunted Mansion, when it becomes Jack Skellington’s house, there’s an oak in Frontierland with jack o’lanterns hanging from its branches. It’s the official Ray Bradbury Halloween Tree. 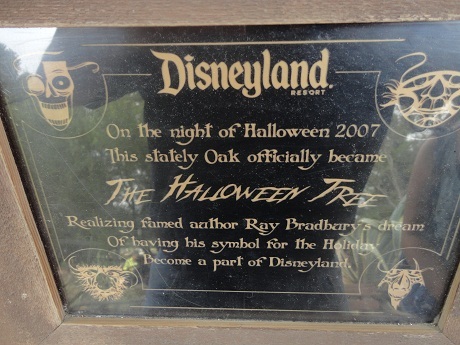 The oak tree is dedicated to the famous author and his beloved book. With Ray Bradbury’s passing earlier this year, my hubby and I wanted to pay tribute to the author who loved Halloween as much as we do. 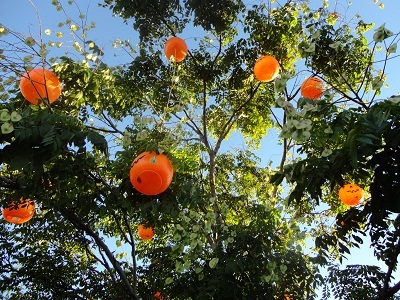 Here’s our version of The Halloween Tree. 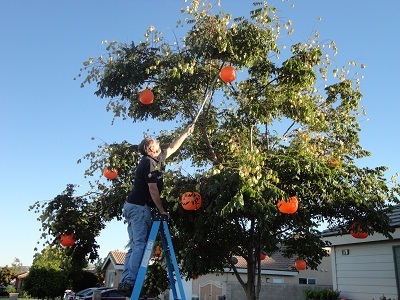 Hubby made a long pole with a hook, wire hooks for each pumpkin, then carefully placed each one in just the right spot. After a second trip to Target to buy more pumpkins, our Halloween Tree is completed. At dusk, hubby flipped on the lights to our Halloween Tree. Neighbors smile as they drive by. Santa Ana winds began to pick up and pumpkins sway as though ready to come to life. Happy Halloween, Ray Bradbury. And thanks for everything! This entry was posted in Uncategorized on October 27, 2012 by mariacisnerostoth. That’s fascinating, Maria. How cool that you got to visit the tree! I love the cover art for the Halloween Tree and the blurb. Masterful! Hi Yvette…. 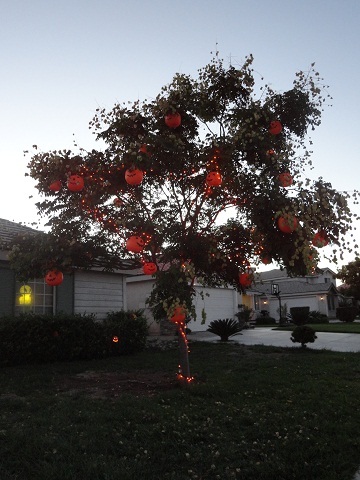 our Halloween Tree is done, 30 pumpkins in all. Yay! Loving it lots!!! Neighbors driving by, smiling. 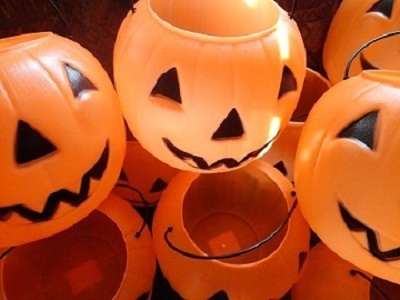 Wind kicking up just enough to make grinning pumpkins sway. Hubby now putting Jack O’Lanterns in the shrubs. Took oodles of pics of tree. Now, just waiting for the sun to set and snap a pic of the tree lit up at night. Oh cool, Maria. You got your tree done. I’ll be interested to see that. How lovely that it’ll light up as well. Sounds great! Yes, I’d love to swap notes soon. Just drop me a line when things calm down a bit. It’s been strange, not writing to you each day! 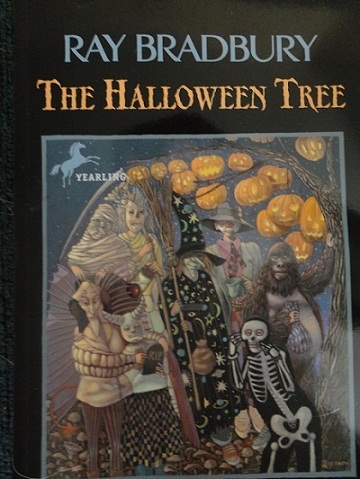 I still haven’t gotten around to reading The Halloween Tree yet even after our talking about it on WANATRibe. The Illustrated Man is one of my favorite Bradbury books. As well, I loved watching Ray Bradbury Presents. He is sorely missed by the SF community. Maria, your tree looks better than the Disney one! 🙂 I love it! Yvette~So glad you got to see the tree! And funny, I was just telling Joey the same thing this morning as we left the house for breakfast. And when we came home, I just couldn’t help but smile from ear to ear as we pulled in the driveway. And as far as the cost of Halloween decorations go, Joey says it’s one of our more affordable ones. The pumpkids only a dollar each at Target. The wire. Old coat hangars. Pole, an old handle from a shovel w/hangar wire attached. New ladder, $125. LOL!! !